Looks like Google just leaked the iPhone X-style navigation gesture feature that may feature in its upcoming version of OS, Android P.
In an unrelated blog post about the “DNS over TLS support in Android P Developer Preview”, Google accidentally shared a screenshot from a device that appears to be running the second Android P Developer Preview. 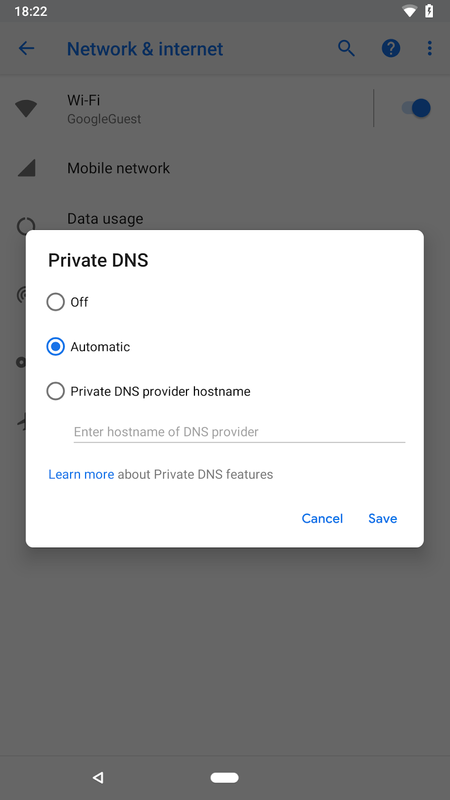 The screenshot suggested that Google is working on a possible iPhone X-like gesture navigation interface to replace the existing buttons for Android P. The post contained a screenshot of the DNS settings with a navigation bar that is completely different from what is currently on Android 8.1 Oreo. The solid circular shape center home button is replaced by a pill shape button like on the iPhone X. Further, the blue color scheme indicates that the phone is running the Google Pixel 2 XL theme. Also, the Recent Apps button or multi-tasking button, is completely missing. However, the back button is still there, which according to Stephen Hall from 9to5Google, is only shown contextually. Shortly after the blog post publication, Google quickly edited the screenshot to crop out the navigation bar. However, you can check out the original, uncropped image, which is still on Google’s servers by clicking here. Whether the leaked screenshot is true or not, can only be confirmed once Google officially announces it. With the Google I/O 2018 coming up next month, we are hopeful to learn more about Android P.